In the UK, locksmiths come from all walks of life, taking a variety of routes to join the trade. Ask any locksmith about how he or she got started, and then go and ask another, and you will more than likely get two different answers – whether it was via supplier-led training courses, a locksmithing apprenticeship, being an understudy to a practicing locksmith or through traditional employment. Although MLA was the first to offer a recognised apprenticeship, it took a significant amount of time for the government to recognise locksmiths as a profession. As of June 2017, details are still being finalised between the MLA and the government to re-develop a ‘trailblazer apprenticeship’. This lack of regulation has given existing locksmiths a very diverse range of skillsets and experience. Of course, diversity is welcome, and diversity is known to bring outside-of-the-box solutions. However, when we start comparing the two professions, we can start to see how gas engineers will be ‘singing from the same hymn sheet,’ whereas our locksmiths could be working from all manner of different pages. For the future of locksmithing, this very diversity could potentially be harming our buildings and our occupants’ wellbeing, as opposed to aiding them. We could be creating an environment where knowledge levels, procedures, best practices and the way building hardware solutions are selected are all different and varied. We are now coming to a stage in the door hardware industry where development is rapidly overtaking existing knowledge. 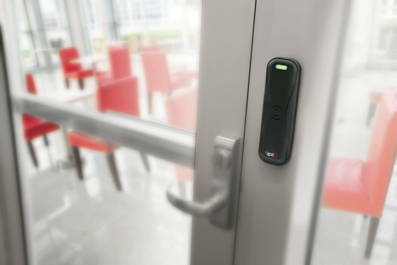 Electro-mechanical ‘smart’ hardware means the ability to unlock doors from phones, control access to secure areas and remotely lockdown, are all feasible and affordable functions which are being sought after by building managers. A case in point happened as recently as 2016, when a fire door in a hospital that was fitted with a self-closing device shut on an elderly patient, causing injury. Unfortunately, this injury contributed to that patient’s death. Intended to be an aid for the door, it has instead caused accident and tragedy. After the case, the Department of Health suggested that risk assessments should be carried out on all fire door closing devices to assess appropriate closing times, taking into account the occupancy of the building. For locksmiths who are ‘self-taught’ and have little knowledge in these electro-magnetic devices and risk assessments, we can immediately see how ongoing training in this area will benefit them. However, the varying level and difference in understanding of door hardware across both facilities managers and locksmiths leads to different ideas between the two parties. The former may be constrained by budgets and ‘the bigger picture,’ while the latter may focus on single aspects of doorways and locks, particularly if they are not acclimatised to electro-mechanical systems that are in place or being planned. These blurred lines can be difficult to navigate, and health and safety can be compromised if one party or the other is negligent in their ‘Duty of Care,’ which is another unwritten code of conduct. Take lockdown situations for example – a popular topic given the amount of security issues we are now accustomed to seeing in the media. For the un-initiated locksmith though, there may be skills gaps which cannot be plugged – and this can lead to improper solutions, or even botched jobs. When faced in a lockdown situation, if there is a fault in the locking systems, this can be life-threatening. When botched jobs do happen, it then becomes a story of whose duty of care it is to maintain the working order of the building and the locks – has the locksmith correctly set the locking devices, or have they set them to what they think is the correct setting, when it actually is not for that building’s particular use? Who is liable? Lori Einhorn was unfortunately assaulted during a visit to her then fiance Kenneth Einhorn’s flat by an assailant who was not a tenant of the building. The case was brought against the building landlord David Seeley and locksmith REM Discount Security Products. The claim was that the front door lock on the building was allegedly broken to an extent where it could be opened “with a firm push, even when locked,” and that as installers of the lock, REM allegedly had a duty of care to the plaintiffs for their faulty installation.